Went to Espressamente again today with my wife. My first experience was not that great. Reached there around 3pm and lucky me, Michael was around. It was lovely to be able to chat with like-minded coffee enthusiast. He was true to his word and offer to make me a nice drink. I asked for an espresso for myself and an americano for my wife. Many times one can somewhat predict the quality coffee by observing a few visual clues. 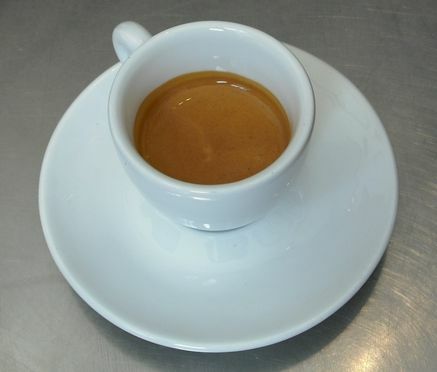 Let’s consider the 4 “M”s of good espresso. Macchina (espresso machine) – La Marzocco, good machine. Macinacaffe (grinder) – Mazer, excellent grinder. Need a good Mano to adjust the grind. Here’s the Mano. How do you recognise an expert? Notice his attention to details. 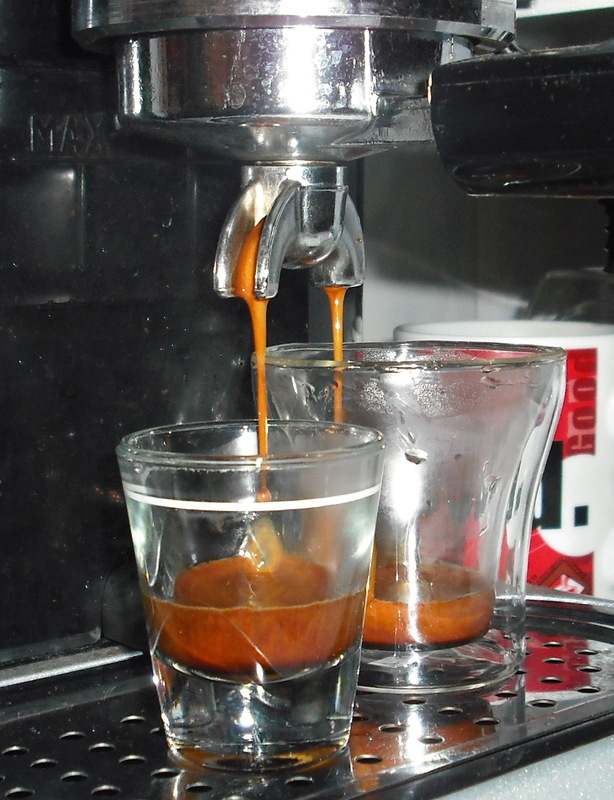 – Flushing the portafilter to ensure that it is hot. – Careful dosing and tamping. The visual from the extraction looks good. It is good. Smooth, medium acidity, moderate body and a nice after-taste. No bad bitterness. In fact my wife was raving about it afterwards and she is one who normally gets headache drinking bad coffee. The americano was just as good, with hint of fruitiness. You know how I always rant about not finding good espresso in any cafes in Malaysia. I take that back. Here’s one worth trying. The Miscela (coffee blend) of course is Illy. Normally I don’t fancy Illy. In most cafes, they are very much lacking in freshness. I guess in Espressamente with reasonably high volume traffic, their beans should not be staling so fast. And Illy was known to be quite a forgiving blend. Therefore, if it is reasonably fresh with the 4 “M”s in sync, you should get a pretty good cup. 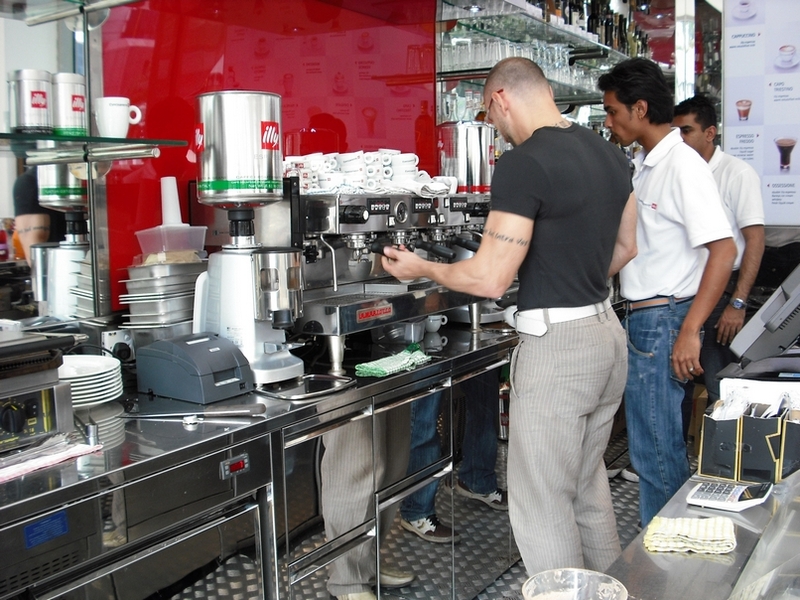 And if you are at Espressamente the next time and the espresso is not good, most likely it will be the Mano’s fault. Ask them to redo or complain to Michael. Lastly I asked to try again their cappuccino. What can I say? It was better than my last visit. Microfoam was better. It’s a decent cup of cappuccino that I consider above average and certainly better than most cafes. Oh yes, the cups.. it’s top notch. Thick and beautifully designed. Here’s Michael on the left with his crew. It’s a pleasant afternoon, good espresso and nice coffee. 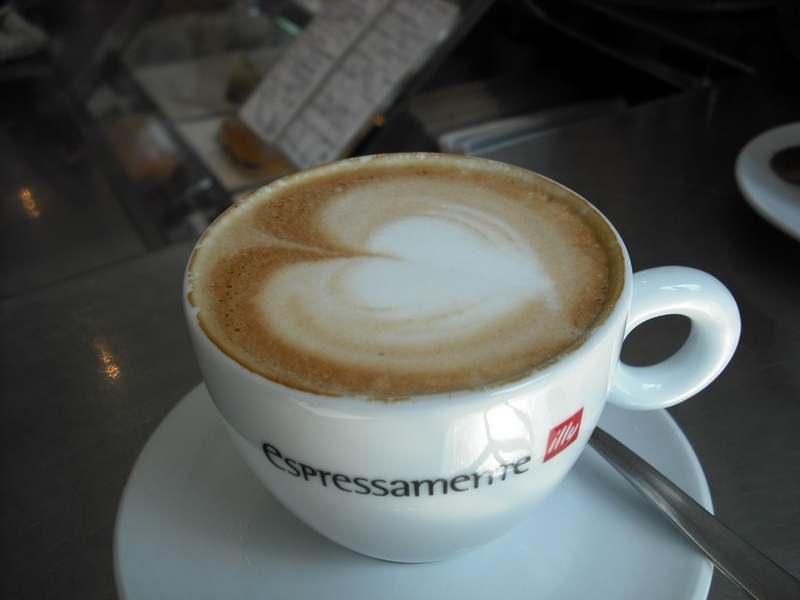 For good coffee in Kuala Lumpur, Malaysia… visit Espressamente. This entry was posted in Americano, Barista, Cappuccino, Coffee, Coffee Beans, Espressamente, espresso, grinder, Malaysia on April 20, 2008 by KF Chan. Got a new digital camera, Fujifilm FinePix J10. Most of the pic I took from 6 months ago was from a Nokia N73. Though it is an excellent digital camera on a mobile phone, taking picture a night when natural light was lacking, most didn’t turn out well. And now that I’ve returned the N73 to my ex-company, I really needed to get another workable camera. With the Asia Barista Championship coming up in Singapore on the 22nd to 24th April, I guess I need to have a decent camera to cover the event. Here are some pics from the New J10. 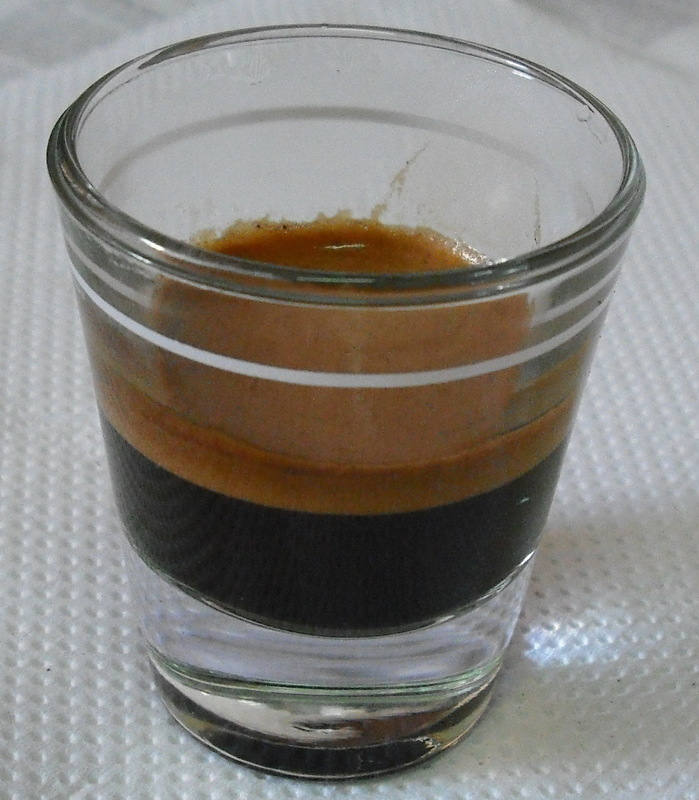 A Ristretto.. a Starbucks single shot glass and a Bodum Double-walled 3oz glass. About a minute after brewing. A Ristretto at about .65oz. Cool? The Fujifilm J10 definitely better than Nokia N73. This entry was posted in Cappuccino, Coffee, espresso, Malaysia on April 20, 2008 by KF Chan.